Book selection from the More-than-Human Care reading list. The Research Network is Stuart Hall Library’s public programme of monthly presentations and reading groups. It is a space for researchers, artists, academics, curators, activists and library users to meet and discuss aspects of their practice. We are looking for research or practice presentation proposals for the new 2019 series, launching in April. 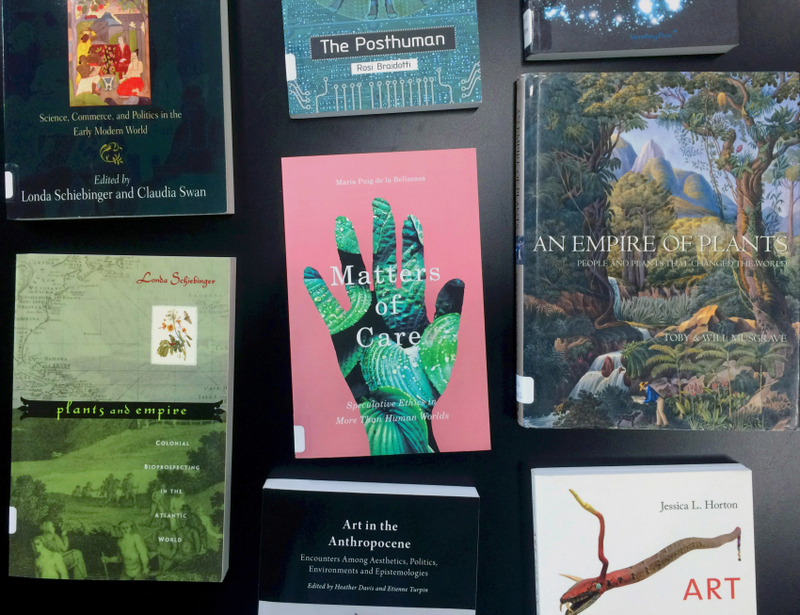 This could include lecture-performances, screenings and talks, for which the Library then finds a relevant respondent to encourage a call-and-response dynamic. The deadline for submitting is 7th November 2018. The next annual theme entitled More-than-Human Care expands on the current series Duties of Self Care. It looks deeper into the complexities of our relationships with ourselves, each other and the earth. Knowledge and affect are spun between humans and non-humans, resources flow, power is abused. Self-care necessitates collective-care. Extractive technologies of the global North continue to cause ecological shifts which are felt disproportionally in the global South, and by Black, Brown or poor communities in the North. Alternative ways of knowing and living in alliance with natural worlds are ignored or eradicated, to meet the demands of industrial capitalism. The inner ecologies of our bodies and the outer ecologies of our planet are connected in symbiotic and interdependent ways. We rely on air, water and soil quality – and therefore species diversity – to be well. Our immunity is continually sabotaged as much as it is strengthened. We exist in relation to each other, ancestors, elements, spirits, computers, bacteria, planets and plants. An oscillating sense of self and collective care can inform artistic and curatorial practice. It can enable us to challenge structural oppressions and understand our intersecting existences. More-than-Human care is therefore decolonial, fractal, iterative, non-linear, resilient, multi-sensory, experimental, ancient, futuristic, speculative, intentional. It poses a number of questions amongst them being: What are the politics of cohabitation, across organic, technological and spiritual realms? How fixed and porous are the boundaries between us? We have created a list of resources to support the development of proposals: More-than-Human Care reading list. Proposals are encouraged from practitioners working in the field of visual arts and visual culture as well as those whose practice touches on social sciences, cultural studies and arts activism. We are keen to encourage those already engaged in research-based practices, who are seeking a response to existing or current research or would like to share research outcomes. Research Network events may include in-conversations, artist presentations, performance lectures, discussions, or panel discussions. The Research Network acts as a testing ground for new ideas within a peer group. It is a meeting place for the discussion of practice-based or more conventional forms of research that may include: visual arts, film and media, curatorial practice, cultural studies, social sciences, cultural activism, postcolonial studies, literary studies, including criticism and theory. 4. supply no more than five images which must be provided as part of a single PDF and / or a link to website. Proposals will be selected by a panel comprising Iniva staff and an external expert. The Library programmes workshops throughout the year as such we will not be considering workshop proposals as part of the Research Network. Deadline for proposals: 11:59pm on Wednesday 7th November 2018. We can provide support in terms of marketing, coordination and limited technical support and equipment – please take into account when submitting your proposal and contact the Library & Archive Manager if you have any questions about available equipment. The Stuart Hall Library holds over 10,000 book volumes, a collection of journals including many rare items important to the UK black arts movement, a growing collection of contemporary artist and activist zines, and a substantial AV collection of artists’ films and interviews as well as documentation of Iniva exhibition events. Payment – £100 per speaker. We work with selected researchers and artists to curate the event as required. Sadly we cannot reply to all those who submit proposals, however, we are grateful for the time taken to contribute to Iniva’s programme. Please email proposals to library@iniva.org with ‘Research Network 2019′ in the subject line. Iniva reserves the right to review the criteria and the programme is subject to change.